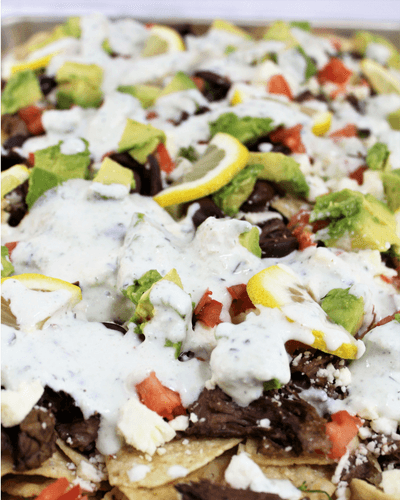 Lamb and Feta Nachos with marinated slow cooked lamb, feta cheese with fresh ingredients like tomatoes, olives, and avocado topped with a tzatziki sauce drizzle. 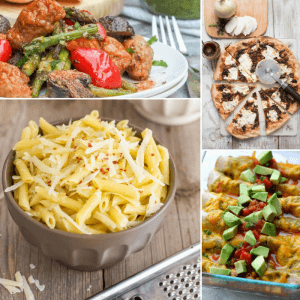 Recipe Swap Club is a food bloggers group that began last October and I have been tasked with some amazing food blogs and this one is no different! I was tasked to recreate a recipe from Simply Delish Eats for February and when I came across these Lamb and Feta Nachos on her site I had a major craving for some Greek inspired nachos. I did not follow the original recipe as much as took inspiration from it. Check out the original HERE. Plus, Luca from Simply Delish Eats makes her own tortilla chips and has a great recipe to do so on her site. 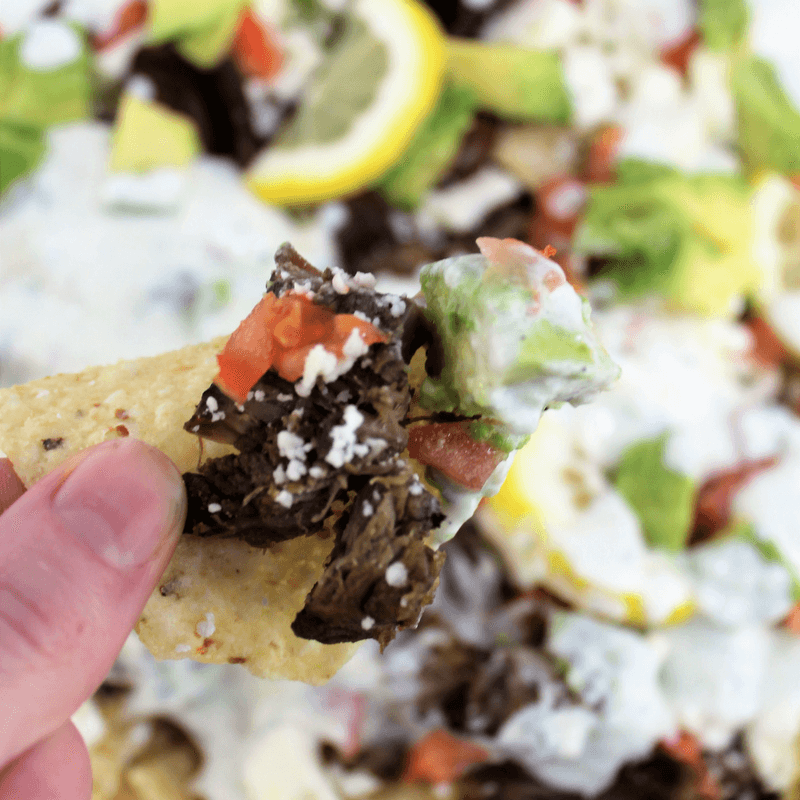 The 2 main components that make these nachos special are the feta and marinated lamb. It is just so darn good! The rest of the ingredients you can really swap and play with to customize to your own taste preferences. The lamb is marinated overnight in a very simple marinade and then slow cooked all day in the crockpot. The lamb shreds so easily and is tender with really nice flavors with nothing overpowering the lamb itself. The tzatziki sauce is optional but really helps give these nachos that Greek flare I was going for with the fresh cucumber and dill. Try our homemade Tzatziki Sauce recipe from here at Simply Made Recipes. 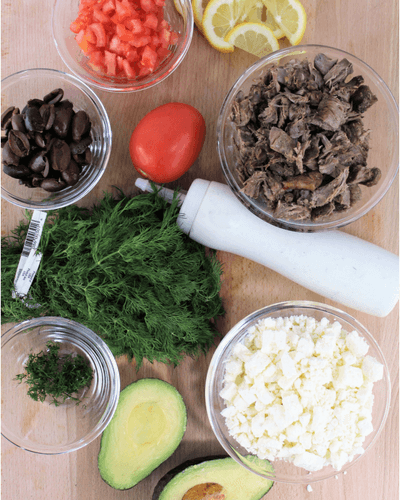 The Lamb and Feta Nachos are also topped with fresh diced tomatoes, avocado, dill, Kalamata olives and lemon slices that really balance out the saltiness of the tortilla chips and gives the dish an amazing freshness. In a large Ziploc bag, place lamb, 4 garlic cloves minced, squeeze the juice from one lemon, 1/4 cup olive oil, 1 tablespoon oregano, .5 sliced onion and a dash of salt and pepper. Place in fridge and let marinate for minimum of 2 hours. I let it marinate overnight. Place the marinated lamb in the crockpot on low of 8 hours with the onion. Shred the lamb. I removed the onion but you can keep it for the nachos if you would like. Diced tomatoes, avocado and slice olives. On a baking sheet, spread out your tortilla chips. 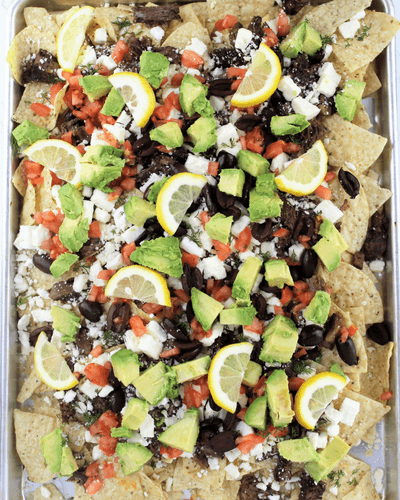 Layer the tortilla chips with the shredded lamb, feta cheese and olives. 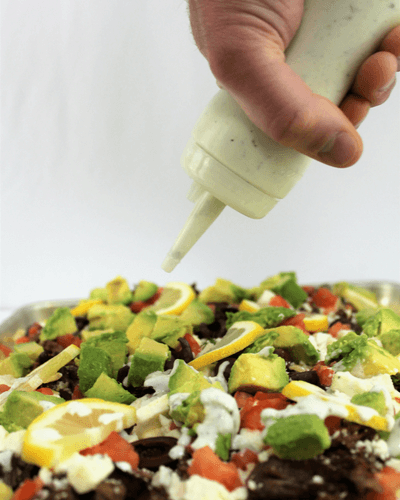 Layer the diced tomatoes, avocado and drizzle your tzatziki sauce. Garnish with sliced lemon if you wish. Find out more about Recipe Swap Club and how to join if you are a food blogger- HERE.